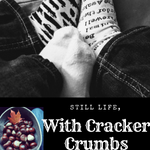 A Poem for Everyone | Still Life, With Cracker Crumbs.. I fell in love with poetry on the laps of my mom and dad, snuggled up close, as they sang nursery rhymes to me, and then later on, Shel Silverstein and Jack Prelutsky and yes, Dr. Seuss too. Poems like Ickle Me Pickle Me Tickle Me Too tripped across the room, enchanting me with their rhythms and of course humor; my dad read The Owl and the Pussycat to me every single night before bed. And who, old or young, doesn’t love Listen to the Musn’ts. Even after my parents stopped reading Silverstein to me, my cousin and I used to spend family holidays curled up in a corner, reading Where the Sidewalk Ends and A Light in the Attic together, and we still talk about these poems sometimes. As I got older, I didn’t read as much poetry anymore. Then my senior year of high school I took an Advanced English class where we spent a whole semester on poetry, and I fell in love all over again. I was introduced to Emily Dickinson, Edward Arlington Robinson, T.S. Eliot, Maya Angelou, Langston Hughes, and Dorothy Parker, who I discovered on my own that year. I wanted to be Dorothy Parker, with her sharp. clever wit. I wanted to be a big time journalist, and sit at the Algonquin Round Table. (Ok, I still want to do that) I started smoking – yeah, I started smoking not due to peer pressure or anything, but because all my favorite writers and authors did it- and she even influences me a bit now. A craft cocktail bar opened up in Detroit about 8 or so years ago, and what did I order? A whiskey sour, like my old idol Dorothy Parker. I no longer smoke, but I do still enjoy a whiskey sour every now and again. Last Friday my husband, Wyatt, and I stumbled into an art show celebrating the beauty of the spoken and written word, titled Pose and Poetry. For the entire month of April, works of art inspired by poems are on display, as well as a night of open mic spoken word. We had attended a Free Spirit Fair in the same building, and saw the exhibit going on, and decided to check it out too. I am so glad that we did. I loved it. There was this beautiful, delicate piece of artwork, a sculpture of glass shaped into a little nest, with strips of Dickinson poems tucked throughout. It was exquisite and lovely and I adored it. I can’t stop thinking about it really. Dickinson is a favorite of mine, and this piece was really a gorgeous tribute to her work. Patrons were encouraged to participate as well, by writing a line from a favorite poem and sticking it to the window. I of course had to do this too. The problem was, which of my favorites would I leave a line from? Degrees of Grey in Phillipsburg flitted through my mind, and I considered Hope is the thing with feathers by Dickinson but she was already so beautifully represented. But in the end there was no other poem I could have chosen besides The Love Song of J. Alfred Prufrock, my very favorite of them all. These days I read a lot of Mary Oliver and Wendell Berry; different poets affect us at different points in our lives, and right now, Oliver and Berry hit me where I am. I think there is a poet or two out there for all of us, even in some of us. Or maybe just a singular poem that calls to us, even just a line that sings to our soul. What do you think? Is there a poet or poem that you love? Feel free to drop a line in the comments! I would love to read who or what speaks to you. Those are some impressive books. OMGosh girlfriend, I looked through my read books on GR and scrolled all the way back to around 2015 when I had tried Robert Frost. I should reread Silverstein as I read him as a child; my youngest loved his books one year in school. Who do you think I should try also? Silverstein is always a good read, no matter what your age! I think too that as we get older, we “get” more of the message he wrote about! Hmm. Maybe start with T.S. Eliot’s Old Possum’s Book of Practical Cats as a gateway? You can even read them with your girls – these are the poems that the Broadway musical Cats is based on. They are whimsical and some of them a little bit sad, but they are great poems. Or maybe Mary Oliver, or Wendell Berry? Or if you are feeling gothic, Poe? Just have fun with them, and if you can, read them out loud! I think poetry is meant to be heard and spoken and I think it changes it totally. Whatever you do, have fun! I would love to hear about what you end up reading and what you think! Thank you for all the great thoughts and recommendations. The cats one sounds fun. My girls loves cats.